An intense character study spanning two generations, The Place Beyond The Pines takes an in-depth look at the complexities of responsibility, destiny and the lingering impacts of today's actions on the long term future. In upstate New York, Luke Glanton (Ryan Gosling) is a low life drifter, good at only one thing: riding a motorcycle. Luke bumps into former girlfriend Romina (Eva Mendes) and learns that her infant son Jason is his child. Although Romina has moved on and is now with another man, Luke is determined to insert himself into her life to try and be a father. To earn an income he accepts a job at the ramshackle car repair shop of Robin (Ben Mendelsohn). But Luke seeks more money to try and impress Romina and buy things for Jason. He forms a bank robbery partnership with Robin, with Luke's motorcycle riding skills helping achieve smooth getaways. Luke's misadventures with the law eventually result in a tangle with rookie police officer Avery Cross (Bradley Cooper). A trained lawyer and the son of a respected judge (Harris Yulin), Avery is ambitious, and the incident with Luke traumatizes him. He then stumbles onto a police corruption ring led by officer Deluca (Ray Liotta). Avery's career blossoms into power and politics at the expense of his wife Jennifer (Rose Byrne). Years later, Avery's neglected son A.J. (Emory Cohen) is in high school and drifting into a life of drugs, alcohol and parties. He meets and starts to befriend Jason (Dane DeHaan), now also a teenager at the same school. 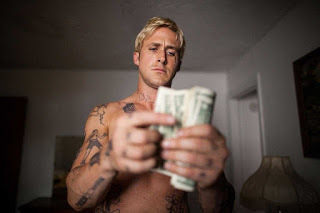 Directed and co-written by Derek Cianfrance, The Place Beyond The Pines is long, moody and humourless. It is also a gripping drama, singularly focussed on the ambitions and failures of its central characters. Cianfrance creates detailed portraits of two men grappling with what life has to offer, and finds the compelling threads that connect the actions, motivations and destinies of Luke and Avery. And it's stylishly assembled, Cianfrance finding the neon, shadows, perspectives and camera angles to give every shot dynamic potential. The film runs for 140 minutes, and it could easily have shed 20 minutes with no loss in quality. Cianfrance is a fan of pregnant pauses and gloomy stares punctuating almost every conversation, and while he goes searching for the rivers of anger and frustration boiling under the surface of dysfunctional relationships, he also stretches the ability of his story to carry weighty loads of profound meaning at every turn. But the themes explored by the film are elaborate and often fascinating. Luke is desperate to find some meaning to rescue his sorry life, and unexpectedly finds it in Jason. His attempts to do good only lead to worse conflicts. Avery is also looking to define himself as something separate from his father, and without looking for it finds himself at a crucial fork in the road of life. He steers towards public good, but falls victim to insidious arrogance. Both men find elaborate ways to damage the most important relationships in their life, and hurt the people they love most. The sons inherit and then amplify the emotional bruises inflicted by their fathers, either propagating or repeating behavioural patterns with the added ferocity of a new generation. In a movie fixated on its characters the performances have to be good, and the cast delivers. Ryan Gosling has the meatier role and creates in Luke a memorable tragic loser, who will find a way to make the wrong move at every opportunity. Bradley Cooper is more reserved as Avery, but does pull off a smooth transition from shaky rookie police officer to smarmy and power-hungry politician. Gosling and Cooper share just the one scene together, as they sequentially hand-off the first two thirds of the movie. Eva Mendes gives Romania plenty of spirit while Rose Byrne takes Jennifer to more passive aggressive territory. The final third of the film loses star power and transitions to Emory Cohen and Dane DeHaan as sons unknowingly living in the shadows of their fathers, and they are adequate. Delving into some of the essential predispositions of the human condition, The Place Beyond The Pines is a rare combination of ambitious and intimate.